After-call work (ACW) is time after an interaction disconnects. Agents use this time to enter notes, select wrap-up codes, and complete any other tasks associated with the interaction. ACW is factored into the Average Handle Time (AHT). The queue administrator determines whether ACW time is optional or required, and how long an agent can take to complete ACW. 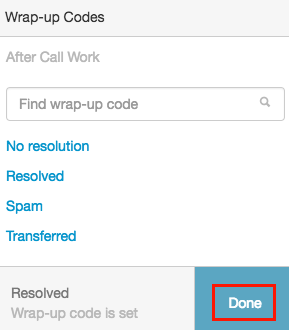 To display wrap-up codes, click Wrap-up Codes or end the interaction. Select the appropriate wrap-up code. If you want to enter notes during or after the interaction, click Notes and enter notes about the interaction. To finish ACW, open the Wrap-up Codes panel and click Done. The Done button is not available until you meet the minimum requirement to complete the interaction. These requirements could include actions such as ending the interaction with the customer or selecting a wrap-up code. PureCloud only tracks the time you spend on ACW when you have an on queue status (idle, interacting, communicating, and ACW). If you change your status to any other status, you go off queue, and PureCloud doesn’t track ACW for the time you spend in that status. Your ACW time ends when you click Done. When an administrator has set a queue to mandatory, time boxed ACW, Save appears instead of Done. Agents must click Save after completing ACW to save their selected wrap-up codes. If agents change the wrap-up code, then they must click Save again to save the change. Agents wait for the ACW timer to count down to zero before receiving their next interaction.